This article is part of the Digital Nomad Series. Don’t miss out the Part 1: How to become a Digital Nomad and Part 2: Working While Traveling if you haven’t read them yet. Traveling is one of the best parts of being a Digital Nomad. I have spent the last 4 years traveling and living in different countries. Being able to move from one place to another is priceless, but to make the most of it there are a few things to consider. In this article I’m sharing everything I’ve learned related to the traveling side of being a Digital Nomad. Before anything else, it’s very important to understand your situation, motivations, and goals to start a new trip. Are you looking for a exciting adventure? Perhaps you want to step out of your comfort zone and go somewhere exciting and challenging? Or maybe you are looking for a more relaxing place? Are you traveling alone or with someone? Do you know how long would you be traveling or do you prefer to keep that open-ended? Understanding what are you looking for and what are you expecting can make a massive difference in your experiences. Calculate how much money you want to (or can) spend in each category per month. Sum up all the categories and that’s your budget. You can divide your monthly budget to get a daily budget, so you will have a precise idea of how much you can spend per day. You have to commit to stay under that budget, otherwise you might run out of money sooner than you expect. Exceptions can be made, of course; that’s up to you, but keep in mind that they will have an impact on your trips. If you have troubles staying on budget, you can keep track of your daily expenses using an app or a traditional notebook. The decision of where to go has to be connected to the two previous points: your goals and your budget. Make sure to do some research about a place before you visit it. If you have a very tight budget and you are looking for adventure, going to a big and expensive city is a mistake from a strategic perspective. To find great places you can do some research on the internet (blogs, TripAdvisor, Pinterest, Google) use some traveling guides such as Lonely Planet (I’ve never used them), ask other travelers or simply follow your intuition and instincts. I’ve added a few apps and resources at the end of this article to help you to find the right destination for you. There are plenty of accommodation choices: hostels, guest houses, hotels, Airbnb, renting apartments, camping, couch surfing, among many others. All of them are different options with their upsides and downsides. As a general rule, the accommodation has to be connected with the purpose of your trip. Some accommodations are very cheap but not very comfortable; others offer some extras such as a common space to work from, washing machines and much more. Others offer an incredible space to rest. It’s up to your taste and your budget. My personal favorites are guest houses and apartments, because both of them offer me a place to stay and work (if needed) and also cook. The guest houses don’t offer much privacy but you can meet other travelers, which is great. On the other side, apartments are the closest you will get to from being home. I usually do some previous research and book my accommodation in advance using Booking.com or Airbnb. There are some destinations where online booking is not available and you have to go with the flow and book your accommodation when you arrive at your destination. No matter where you go, pack the least amount of items possible. You can always find a place to wash your clothes—usually it’s cheap and quick. As you are going to be moving from one place to another, the decision of what kind of bag you take is crucial. I started traveling with a suitcase with wheels. That offered me a lot of space, but it was a bit uncomfortable to move from one place to another. After that I switched to a backpack, and it forced me to simplify and minimize the number of items I took with me. Nowadays I travel with a 58-Liter backpack that I can take as a carry-on when I fly. I found that’s the best solution because it forces me to pack light, plus it’s very comfortable to move around. I also have a normal backpack that I use in my day-to-day travels. When it comes to packing, I have 3 compression packing bags where I pack my clothes separately (underwear, T-Shirts and other clothes). In this way I have everything organized and easily accessible. This helps to save a lot of space because, when compressed, the bags remove the air between the clothes. Because they are waterproof and create vacuum inside, they keep the clothes dry even if my backpack gets wet, and also isolates the clothing from external smells. Some of you have requested the list of items I pack when I travel. I have a list in Evernote, so when it’s time to pack I can track everything. It also minimizes the chance of losing things. As I responded to Julian’s comment on the past article of the series, when it comes to safety when traveling, the most valuable advice I can give is to use common sense. Take your equipment as a carry-on in planes. Don’t leave it in your lodging if you don’t think it’s safe. Bring a padlock with you and use it when you want some extra security. I always travel with insurance. It covers me, my luggage, and part of my gear in case it gets stolen, lost or broken. I use World Nomads because allows you to travel to unlimited countries with the same insurance. Last summer I wrote an article featuring some of the apps I use when I travel ( TripIt, Maps.me, HappyCow, among others). The Basetrip provides you with all the essential information you need when traveling to foreign countries. Just type where are you from and where are you going. The website will show you the currency, plug system, cost of living, best practices, vaccination recommendations, and other relevant information. Nomadlist is a great tool to find destinations for your trips. It shows you the best destinations depending on your traveling preferences. Numbeo has a very extensive database of the costs of living in many categories (rent, restaurants, markets, transportation, utilities, leisure, clothing, buying an apartment among many others). Just pick a city and get all the information. You can also compare two cities. It also offers other interesting index tools as Quality of life, Crime index, Traffic, or Pollution. When you travel with other people, Splitwise is a must-have. 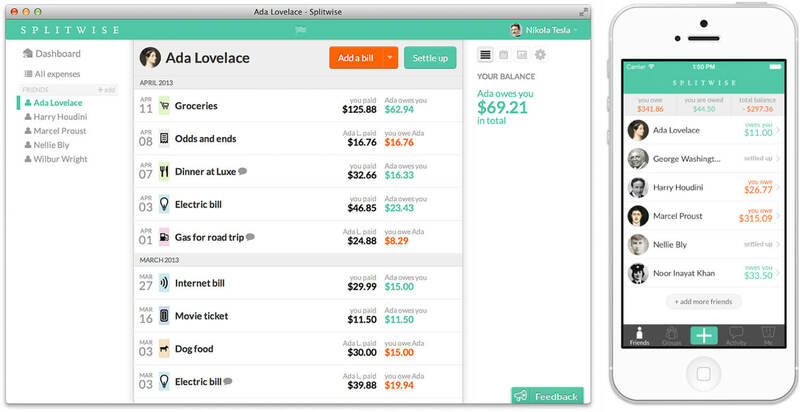 It simplifies a lot sharing expenses and does the math for you. Track who paid each expense and at the end of your trip you will have a total amount of how much you owe and are owed. Planning is an essential part of traveling because it allows you to be flexible and maximize the chances of having great experiences. Knowing certain resources and tricks can also make a big difference to your travels. If you are not an avid traveler yet, I hope this article helps you to start traveling and make your trips more enjoyable. Did I miss something in this article? As always, I would love to hear your comments ! Very interesting, thanks Magoz. I would like to know what program do you use to do your animations, (Animate, After Effects…??? ), they are so great! Thanks Magoz, it helps a lot! Brilliant article as always! Love all the information you pack into them. I was wondering, do you ever go travelling with other people or if just on your own? I’m curious if you find it mentally challenging or if you actually prefer your own company (I know I sometimes do but it’s nice having people to talk to occasionally). I enjoy all kind of trips. For example, when I spent 7 months traveling in Asia, I started the trip with my girlfriend, continued alone for 4 months and then a friend joined me. Each part was a completely different experience and required a different mindset and expectations. I find that traveling alone offers a more thoughtful experience, as you are on your own. You have more freedom, but you are in charge of everything. I think that traveling with a partner is easier because the responsibility is divided. But, at the same time, when you travel with someone you have to make sure you are compatible. Sometimes it requires some time, practice, and work. In any case, even if I travel with other people, I usually need having time alone. To work, write, or read but also to enjoy the trip as an individual. Thanks again for being so generous. Question; sorry if I missed it, but do you put your laptop and other devices in your backpack? Of course, you’ll want to keep them with you while on the airplane so you must take them out or put them in another smaller backpack, essentially carrying 2 backpacks? How do you do it? thanks in advance. Hope you had a fantastic summer! – When I travel with winter and summer clothes or carry more stuff in general. In that case, my big backpack gets more packed. I put all my gear in the smaller backpack, and I carry both backpacks at the same time. – When I travel super light (most of the time), I put everything in my big backpack (including the smaller backpack) because there is space and the backpack when it’s not super full is not as big. Really a nice blog, thanks for sharing this useful information.